It may be the biggest shopping day of the year, but it’s also the most dangerous. 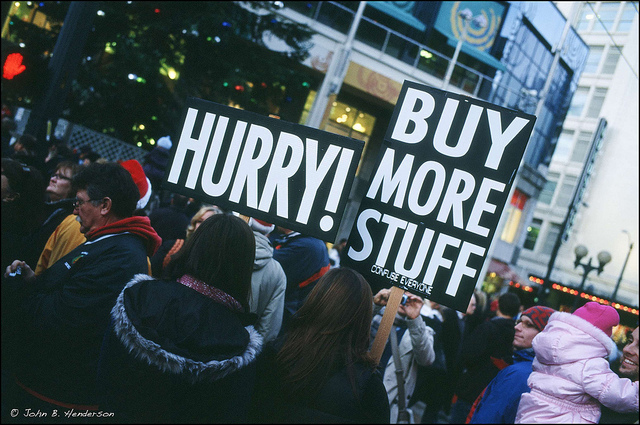 Black Friday shopping isn’t just the start of the Holiday Shopping season—it’s also the start of the most stressful, anxiety producing, budget draining, injurious time of the season. But take heart—surviving and emerging successful from a Black Friday shopping excursion isn’t as hard as it looks if you are prepared, you don’t panic, and you have a plan. It’s like heading into any hostile environment—with the right tools and attitude, you will survive. Make a plan of attack for your day and be sure to use your bookmarked websites or the many available smartphone apps from the major retailers to locate the items you want. Arrive early, and divide and conquer. In order to get the most desirable items you should consider arriving as early as 4am (as many shoppers will do) at the store you plan to visit. Also consider joining forces with other shoppers and splitting up your list—for example, you head to the electronics store to buy items for yourself and your friend, while they head to the toy store. If you encounter a stampede of shoppers, stay focused and visualize your goal. Do not freeze in front of the pack; do not wait for the crowd of shoppers to get close before you make your move. Reacting early and decisively in crowds offers your best shot at survival. Animals travel in herds because there is safety in numbers, and the safest place is at the center of the pack, insulated from predators. Avoid the temptation to join the herd—you cannot shop if you cannot see the merchandise. Do not move toward the oncoming herd. You risk being trampled if you try to thread your way through a stampede. If you are unable to get out of the way of a fast-moving crowd, bring your arms in tightly around any packages you are carrying, turn your body in the direction of the crowd, and let yourself be carried along as you work your way to the outside of the herd. If you need to negotiate a crowd, stay on the edge. Use the space near the walls to gain a few extra yards of room. Most shoppers will leave at least several feet between themselves and surrounding walls. This will give you room to maneuver. Move slowly and decisively toward the front without appearing too aggressive. Shoving or cutting people off will provoke flying elbows and closed ranks. Keep your eyes on the other shoppers, so you can anticipate their movements. Maintain a calm demeanor as you close in on the target item. Breathe evenly and slowly. Avoid signaling your urgency, which might alert the crowd to the desirability of the toy or other target. Avoid stepping on toes or panicking other shoppers, which may cause a stampede. Written by Dave Borgenicht. Dave is the coauthor of the wildly successful Worst-Case Scenario Survival Handbook, which has spawned numerous sequels, games, t-shirts, a TV show and more. To find out more about the Worst-Case Scenario series, head over to ChronicleBooks.com, or follow the Worst-Case Twitter feed @WorstCaseBooks. Photo Credit: Soon.